It is 70 years since the state of Israel was born out of the first Arab-Israeli War under the leadership of the much-revered founding father, David Ben Gurion. Thinking Israelis must wonder how political life degenerated from that heroic beginning to the corrupt and racist prime ministry of Mr. Netanyahu. 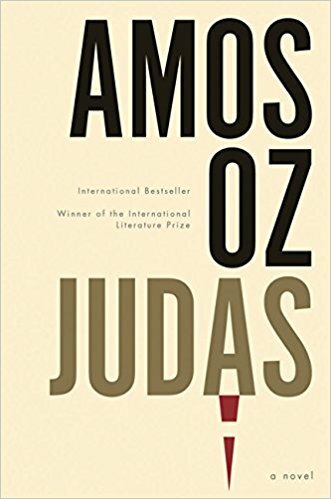 Amos Oz’s Judas takes us back to that beginning and tells a gentle and thoughtful story to help us see that the country’s present troubles are rooted in that apparently idyllic past. At one level Amos Oz’s book can be read as a historical novel set in the 1950s, when Israeli society was still absorbing the nationalist ideological outcome of the Jewish victory in the Arab-Israeli War of 1947-8. To understand this core topic, I find it helpful to lay out the historic ‘branches’ of Zionism which developed from Theodor Herzl’s incipient, innocent Zionism (“a national home for the Jewish People”). See the APPENDIX below for explanation of the 4 types. Amos Oz’s Judas is about the victory of Type-2 over Type-3 Zionism and its consequences. Those who supported the notion of a state in which Arabs would have equality with Jews lost sway during the Second World War, when news of the Holocaust reached Palestine. As a result, the new state of Israel won the 1948 War under Ben Gurion’s nationalist leadership, which enabled him to establish the exclusivist ideology of Israeli statehood as the mainstream, while those who favored rapprochement with the majority Arab population fell out of favor. Amos Oz fictionalizes this event as the recalling of a debate between two former players in this drama, one a “Ben-Gurionist” and the other a “Buberist” (my invented shorthand) brought together in one household by the marriage of the son of the first to the daughter of the second. That’s the core topic. The core issue of the book is that the verdict of history has now labeled the “Buberist” a traitor, though his position was once respected as righteous. The discoverer of this conundrum is a young neutral observer, a grad school dropout anti-nationalist, who comes into the house to provide elder care. However, it so happens, this student’s thesis research was an inquiry into the place of Judas Iscariot in the Judaic intellectual tradition. His research, in a nutshell, led him to discover that Judaic scholars labored to show the Christian labeling of Judas as “traitor” is a maligning of the ‘true’ story: The tragic disintegration of Judas’ faith in the divine power of Jesus as he watches him bleed to death on the cross, just like any other human being (including his two crucified companions). The most powerful passage in the book is the reconstruction of the story of the crucifixion as seen through the eyes of Judas, who in a parallel process suffers the descent of his own psyche into the empty despair that climaxes in infamous suicide. Interestingly, for those of you who need romance in a novel, that legacy of despair flowing from inability to overcome the deep sense of messianic failure is embodied in the “Buberist”’s daughter. A beautiful war widow, she is rendered permanently incapable of loving anyone as she dwells bitterly but impassively on the branding of her father as a traitor to Israeli national destiny. How that plays in the growing love of the young student for this older woman is another thread in this tapestry of interwoven stories. Amos Oz’s architectural design of these intertwining tragedies is masterly. While I learned to understand the conundrum of the beginning of Israeli nationhood better, I also felt Oz gave me a more nuanced sense of tragic sympathy for the role of Judas in incipient Christianity, in its parting of the ways with Judaism – and in the further darkening of the Judas character in Christian anti-Semitic lore. Oz has used his career as an Israeli novelist to level soft, but introspective, critiques at the Israeli state and society. His is not the hardened salvo of condemnation for the destruction of villages one reads in Israeli historian Ilan Pappe’s The Ethnic Cleansing of Palestine, which covers the same period. Yet, in his subtle and thoughtful book Oz makes clear that the principle of the universal equality of all humans, including Arabs, was deemed as traitorous disloyalty to the state from its very beginning. I recommend this book for both its introspective tone and its refusal to find an easy solution to the still unreeling tragic dilemma of Israel’s existence. This is also a good story. Read it and weep – for those betrayed by history. 1. Jabotinsky Zionism – hard-right Jewish nationalism, centered on the goal of a sovereign Jewish state in Palestine and the exclusion or removal of Palestinians Arabs. Jabotinsky, a successor of Theodor Herzl in the early Zionist movement, saw Arabs as inferior and unsuited to peaceable coexistence with Jews, and advocated military force to coerce Palestinian Arabs into accepting the state of Israel. Today reflected in the right-wing Netanyahu coalition government. 2. Ben Gurion Zionism – more moderate Jewish nationalism that purported to stand for co-existence (though not equality) with Palestinian Arabs. Nurtured in the myth of the first Arab-Israeli War (1948) as a heroic, defensive war of independence against militant Arabs. Dominant through the Labor Movement until the early 90s. 3. Martin Buber Zionism – nationalist “soft” Zionism stressing co-existence with Palestinians based on the shared and equal humanity of Jews and Arabs. Lost momentum during the Holocaust, but still prevalent among the Israeli academic left and the Peace Now movement. 4. Jewish Anti-Zionism –secular (more American: Noam Chomsky, Alfred Lilienthal) and religious (more Israeli: Naturei Karta). Never politically effective, but possibly gaining among those members of global Judaism who are disgusted with Ariel Sharon’s and Benyamin Netanyahu’s overtly racist anti-peace regimes. Bert de Vries (Director, Umm el-Jimal Project) is professor emeritus of the History Department, but he continues to administer and teach the Archaeology Minor Program at Calvin. Ironically, as his teaching duties faded the Umm el-Jimal Project, which he directs, has flourished. This entry was posted in Bert de Vries and tagged Amos Oz, book note, book review, history, Israel, Judas, Palestine, Zionism. Bookmark the permalink.